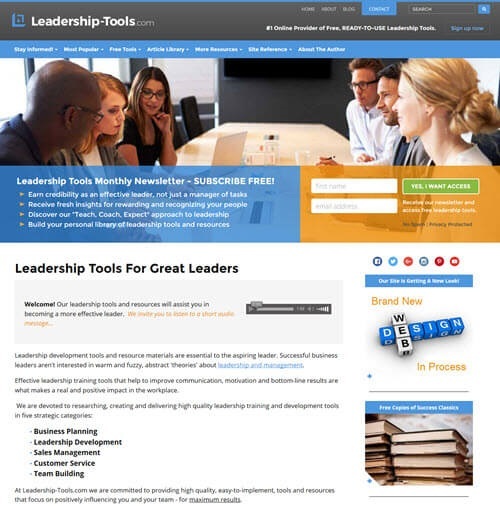 Our new website design has been in the planning stages for the past year so we couldn't be more excited to finally unveil our brand new Leadership-Tools.com "look and feel". Over the next several months we'll be working hard to convert all of our webpages to the new design, so please bear with us as we work through the process. Our new design comes with a lot of good news. As we update each page we'll complete a rigorous review of page content. Our review will ensure that the information provided is up-to-date and continues to provide the best quality content for our readers. It's Time To Change It Up! As time passes along, it's easy to become satisfied with doing things the same old way. But that's boring, right? We all know that if you don't continually push yourself to change; to grow; to improve, competitors will simply pass you by. Given that our website is all about the mastery of leadership and self development, it's time we push ourselves to achieve the next level of success. 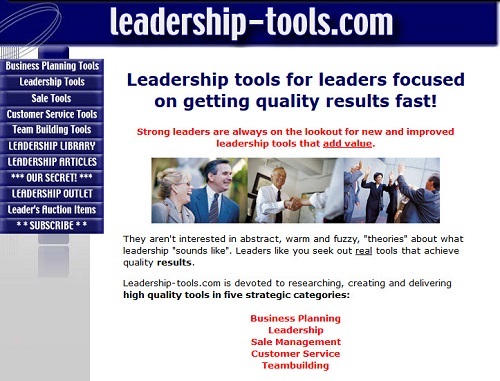 We also thought it would be fun to share just how Leadership-Tools.com's site design has evolved since we first started back in 2002. Our first design was using a very basic site template. We didn't even have a logo! New color scheme, customized header with a new tag line, but still no logo. After a while we decided that red was really not a great primary color. It just didn't provide the warmth and friendliness that we were trying to convey. So we changed it up again and went back to using more blue; added more imagery in an attempt to appeal to working professionals and provide a sense of trust with our readers. At this point we were coming up on our 10 year anniversary! It was amazing how much we had grown the website, with over 20,000 subscribers. Plus, as a website owner I had learned so much about HTML coding that I decided to do a complete refresh of the site, uploading my own HTML coded pages. Doing so enabled us to expand the look and feel of the website, using multiple columns. We also adding audio snippets to give the site a more personal feel. Of course, we kept building our library of free and low-cost leadership tools for our visitors! In the past couple years there has been tremendous advances in how websites are designed in order to appeal to all users, regardless of which type of device they use. We'll talk more about that below. We hope you like our new website design and much as we do! The old saying is true, "You only have one chance to make a good first impression." So we want to put our best foot forward and welcome new visitors to a website that is visually appealing - providing best-in-class content, while also providing easy and intuitive site navigation. Our new design is fully responsive for all types of devices, including desktop, laptop, tablets and mobile phones. 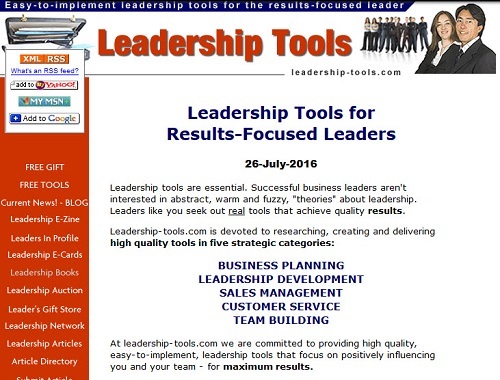 "We are proud to be a generous provider of leadership tools, and we’ve only scratched the surface of what’s possible!" As technology has dramatically improved over the past several years, more and more users are accessing information via their mobile phones. Therefore, our site must be fully compatible to your device - whatever that device may be. Using a responsive design significantly improves the visitors experience. Responsive site designs provide many new bells and whistles such as faster page speed, site security enhancements and improved search related traffic. However, the most important thing is that you (our valued customer) will enjoy a better user experience. We invite you to test out the new design. 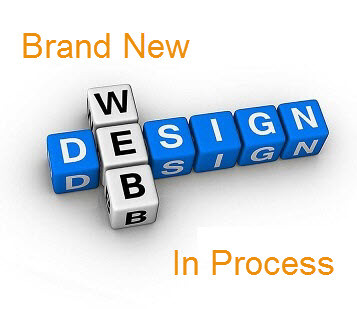 Open our website on different devices and see for yourself how the new website design is rendered. For example, using your mobile phone, click on the Menu button at the top for quick and easy site navigation. New Website Design... and MORE! 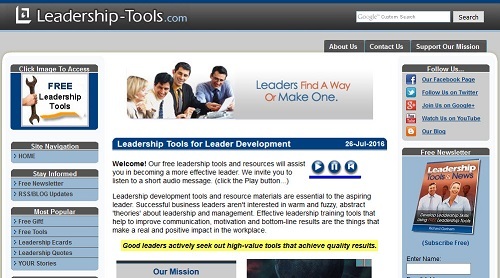 At the same time we update webpages, we'll share some brand new leadership tools and resources. Over the past several months, we've been extending our reach via social media for the purpose of connecting with a greater number of aspiring leaders. If you don't follow us already, check us out on Facebook, Twitter and other social outlets. Join in the conversation. With over 30,000 existing subscribers, we're poised to build a community of like-minded leaders who are eager to learn and further develop their leadership skills. So if you consider yourself to be a proven leader and you have helpful advice or insights to share, let us know - perhaps you can provide a guest post or article for our reader? 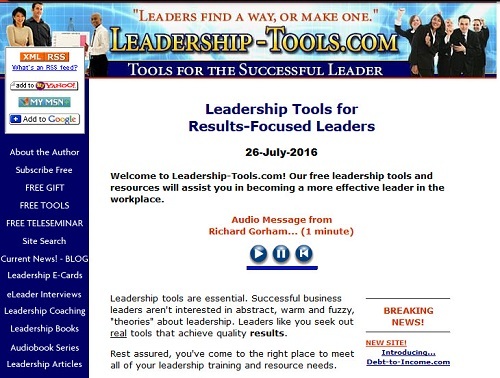 We are excited about the future direction of Leadership-Tools.com. Please consider subscribing to our free newsletter so that you won't miss out on future site updates, valuable leadership tools, resources and tips. Thanks again for your support and understanding as we work through the process of converting webpages to our brand new website design.